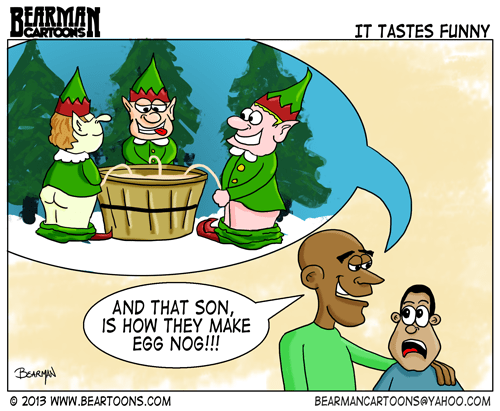 This cartoon is for all the Egg Nog haters in the world including my wife who instead of calling it Elf Piss, jokingly always refers to Egg Nog as Phlegm. I, on the other hand, can’t get enough of the stuff and wonder why consumption seems to be limited only to the holiday season. Speaking of holidays, I am taking one so there will be no updates until after the new year here and I will be absent from visiting other’s blogs for the time being. So as a bonus, Michael Pohrer of Tooned In has updated his guest cartoon he did for me in a past year. Have a safe and enjoyable Christmas and New Years and I will see you in 2014. THAT’S why I hate eggnog. I knew it. Merry Christmas, Happy Holidays, etc., Bearman! Can’t do the eggnog either, bearman. Oddly, I like egg custard. Love the comic and Michael’s animation! I’m grateful for everyone who hates eggnog. Leaves more for the rest of us. Still would be nice if they made it available in July!! I’m with your wife on the eggnog. That’s some nasty stuff. Wiley Miller (Non Sequitur) also did a cartoon of Santa pooing in a chimney, although I’m not sure who drew their version first. I only like my eggnog with a nice shot of whiskey…kills the elf germs! Do elves have yeast infections? The thought of someone drinking it. Id elves piss eggnog, I want one. Although, I refuse to milk him! [blinks] Ho!Ho!HA! My wife doesn’t like to get her hands dirty, she’d delegate that to someone else! [blinks] ..me! I hate eggnog too! Hubby loves it – what is it with men? So you & my hubby must be the shlubs? 😉 Merry Christmas to you & your family Bearman! So now I wonder what orifice valentine’s candy comes from with cupid. Thanks for the morning chuckle. Come to think of it, none was drunk at our house this year. Is it elf pee or something else they’re shooting into the mix. Looks like those dirty little elves are Joggin’ their Nog. Have a great holiday Bearman!!! Funny sh*t! Seems as though Santa feels the same way. Great holiday cheer Bearman. Your wife is an isghtful woman; the phelgm comment made me snort. Not a pretty sound but a good gauge of comedy level. The Elf cartoon is so wring and so right at the same time. Enjoy your egg nog and family festivities! I was going to say your cartooning skill improved dramatically, but then I realized. . . oh, never mind. Have a good holiday, Bearman. I don’t know… I still like it. As a kid I loved eggnog. But now that I’m a grownup I do not care for it at all. Ha! Just finally home and seeing this. Luckily I didn’t have any nog. I no longer trust elves. I’m still not going to try Egg Nog, Especially now. Wow. I need to get a bunch of elves and start a slightly twisted version of a dairy farm. Eggnog is delicious!